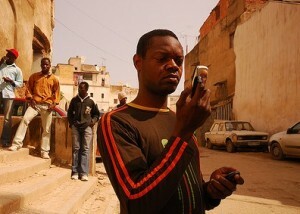 We’ve blogged before about the many applications of mobile phone technology in developing countries, especially when it comes to mobile banking. In much of the developing world, particularly in Africa, mobile phones are thriving in remote villages, while access to electricity, clean water, schools and government services is weak at best; yet cellular service is strong. We show that the zap delivery mechanism strongly reduced the variable distribution costs for the implementing agency, as well as program recipients’ costs of obtaining the cash transfer. The zap approach also resulted in additional benefits: households in zap villages used their cash transfer to purchase a more diverse set of goods, had higher diet diversity, depleted fewer assets and grew more types of crops, especially marginal cash crops grown by women. We posit that the potential mechanisms underlying these results are the lower costs and greater privacy of the receiving the cash transfer via the zap mechanism, as well as changes in intra-household decision-making. This suggests that m-transfers could be a cost-effective means of providing cash transfers for remote rural populations, especially those with limited road and financial infrastructure. While the zap method of transfer did require an upfront investment (in mobile phones, zap accounts and transfer fees), it’s easy to imagine those costs decreasing as mobile phones become more widespread in even the poorest countries. The study’s authors caution that more research is needed on the “broader welfare effects” of the zap transfer method, but it seems inevitable that NGOs will someday dispense much of their cash (if not all) by mobile phone, particularly to recipients in difficult-to-reach locations. So readers, what do you think? Are there any drawbacks to this method of dispensing aid? I've been in some extremely remote villages in Ghana, and the cell service was unreal. Two years ago, I had full-bar 4G service in a place that did not have running water or other modern services. But, it seems to work for them...each village has vendor huts (selling soap, palm oil, candy, etc. ), and there were always several for cell services, including the "zap" programs. There were even charging stations, because -- duh -- their grass huts with dirt floors didn't have electricity! It's an ingrained part of their culture that works well. This sort of program just makes sense, having seen it firsthand. Well, you're delivering the money to the phone, not to a person. If the phone is lost, stolen, or sold shortly before the transfer, or after the transfer but before the person can spend the money, then the money ends up in the wrong hands. It's a bit like secretly leaving the money under the person's door mat: the right person will normally get the money, but you have no way of knowing who actually picked it up. If someone figures out that today's the day for the transfers (say, because he got his), then there might be a spike in phone thefts. Also, you have the hassle of keeping track of phone numbers, but that's less hassle than cash deliveries. I don't know about this program, but there are PIN systems connected to some mobile banking systems that would prevent someone without the PIN from receiving the cash. More to the point, cash is at least as easy to steal or lose the day after the transfer as phones are the day before, and phone theft can be accommodated ex-ante better than money theft can ex-post. True, but they asked for a list of drawbacks, and this is one: The aid agency has an obligation to get the money to the right person, and mobile phones introduce a greater level of uncertainty on that point. Dispensing aid in an area where the infrastructure is available. What about the scenerio where the region just went through a wide spread act of god? Eg :typhoon took out most of the mobile tower, the finance insitution is not available after the earthquake? Did you know, for example, that one fourth of Kenya's GDP flows through a mobile payment system? « Previous PostDid Blackberry Outages Cut Abu Dhabi Traffic Accidents by 40 Percent? Next Post »How Will Sean Payton's Injury Affect the Saints' Offense?